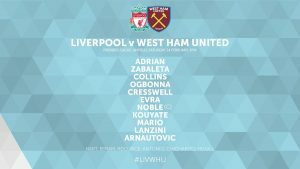 West Ham player ratings vs Liverpool (A)- How did the Hammers perform at Anfield? West Ham slumped to a 4-1 loss at Anfield on Saturday– a disappointing, but not unexpected result for most fans. 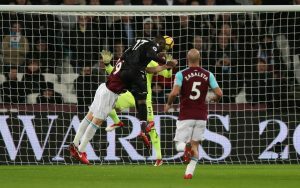 Liverpool crossed 100 goals for the season across all competitions during the game and West Ham’s solitary strike came from Michail Antonio, who netted 70 seconds after coming on as a second half sub. How did Patrice Evra fare on his debut for the Hammers, with the Liverpool fans booing every touch of his given the French defender’s past history with ex Reds player Luis Suarez? How did Manuel Lanzini go on his return from injury? Most of the papers seem to agree that Marko Arnautovic was West Ham’s best player at Anfield, and rightly so. The Austrian tested Karius with a couple of good efforts in the first half and did his best despite playing alone upfront. Antonio, a second half replacement for Lanzini, was their second best player on the park. 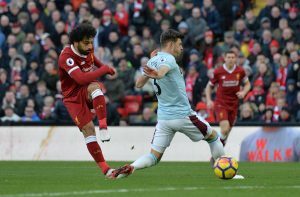 A dire second half performance saw West Ham slump to defeat at Anfield to Liverpool, who ended up beating the Hammers by the same 4-1 scoreline they had won by when the two teams met at the London Stadium earlier this season. Given West Ham’s poor record at Anfield and Liverpool’s attacking prowess, few would’ve given the Hammers a chance before the game, but a two week break and the club’s encouraging performances against the likes of Arsenal, Man City and Chelsea earlier in the season had several fans hopeful. A late first half penalty from Mark Noble, his 50th goal in West Ham colours, saw the home side draw against Roy Hodgson’s Crystal Palace in their midweek clash at the London Stadium. 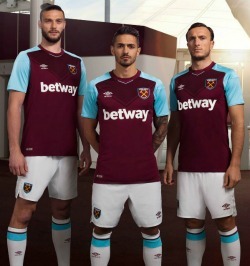 It also marked the first time in over four decades (1974 to be precise) that the Hammers have gone unbeaten in their first five top flight games of the calendar year. Ahead of this weekend’s game at the Hawthorns, we take a look at what happened in the corresponding fixture last season. This fixture will take place on the 16th of September, 2017- last season’s took place on the 17th of September, 2016. West Brom powered themselves to a 4-0 lead by the hour mark, with Nacer Chadli netting a double (including one penalty) and Salomon Randon and James McClean also getting on the scoresheet, as the Baggies registered their first home win since March. Michail Antonio has been named the Hammer of the Year at the Player Awards ceremony at the Intercontinental. 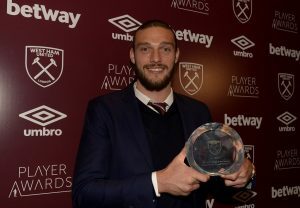 The 27 year old edged out Manuel Lanzini and Pedro Obiang to the award. Lanzini however did get the Players’ Player of the Year Award. Edimilson Fernandes won the Signing of the Year award, perhaps a testament to how poor the club’s signings have been this season when the winner has started only 3 games.